The rare, tetraploid maidenhair spleenwort (Asplenium trichomanes subsp. quadrivalens) has only recently been rediscovered in New Zealand. Several people have contacted me with possible additional sightings. 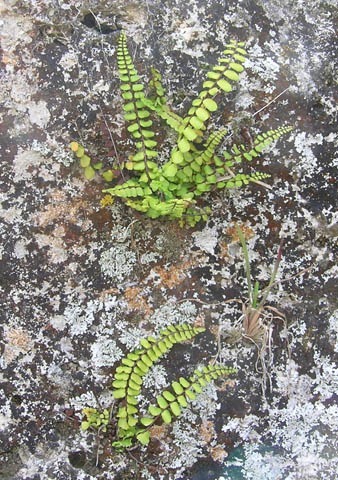 As described by the Scoop website, Jack Ritchie had a maidenhair spleenwort self-sow on a rock used to construct a water feature in his nursery, Tree Guys, in Otane. Jack took us to the local farm where the rock was sourced from, and without too much effort we found a good population: about 70 plants growing on limestone outcrops in pasture. 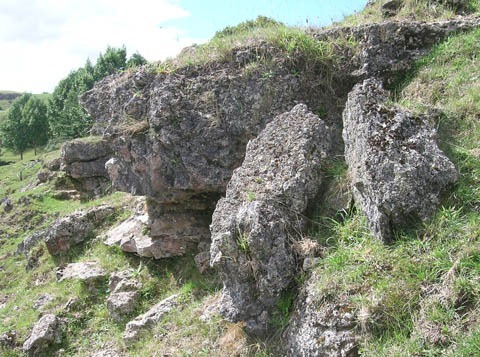 These rocks are host to several plants of tetraploid maidenhair spleenwort. Lara Shepherd (Massey University) and I collected a few samples, and confirmed through analyses of their spores and DNA that they were the tetraploid maidenhair spleenwort rather than the common hexaploid maidenhair spleenwort. DNA sequence data. 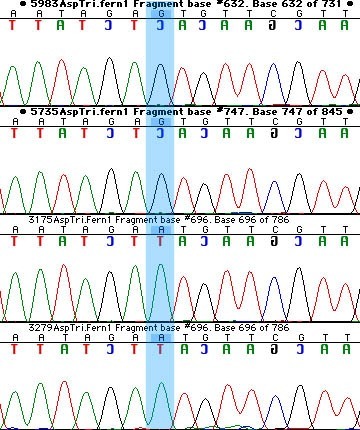 The highlighted position is one of several DNA sites found by Lara that differ between the tetraploid (upper two samples) and hexaploid (lower two samples) maidenhair spleenworts. There is plenty of similar habitat in the region, so the tetraploid maidenhair spleenwort could well be much more widespread. We need to find more than 250 individuals to lift it out of the Nationally Critical conservation category, which I am hopeful we will achieve with more searching. Ideally, it will turn out to be sufficiently common that it doesn’t even need to be on the threatened list. Thanks to Jack Ritchie and everyone else who has contacted me about the maidenhair spleenwort. I have several other promising leads to follow-up when I am next able to escape the office. If you would like to see a tetraploid maidenhair spleenwort for yourself, then visit Jack Ritchie. He is a very knowledgeable and enthusiastic plant-person, and his tetraploid maidenhair spleenwort is the only one I know of in ‘captivity’. Jack’s Tree Guys nursery is in Otane, on the main road between Waipukurau and Hastings.